The 37.69 metre motor yacht AlumerciA, listed for sale by James Lloyd at Edmiston & Company, has been sold in an in-house deal. With naval architecture by Vripack and exterior styling by Omega Architects, AlumerciA was built in aluminium by Dutch yard Heesen Yachts to Lloyd's class and MCA coding, and delivered in 2001. Following her 2014 sale, she received an extensive refit, including the entire interior and major updates to the deck and exterior. 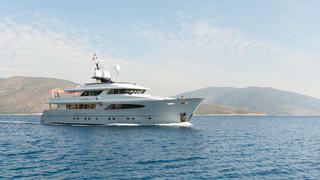 Notably, the main engines and generators were also overhauled and she went on to win a coveted Neptune trophy as Refit of the Year at the 2015 World Superyacht Awards. Accommodation is for up to ten guests split across a main deck master suite, VIP suite and two twins plus two Pullman berths and all cabins have full en suite bathroom facilities. Her interior is simple and modern with aluminium being used for features such as pillars, hand rails and window frames. The main saloon has comfortable wicker furniture and a forward dining table with seating for 10 guests. Sliding doors lead to the aft deck enclosed with glass panels that can be removed in warmer climates to create a large al fresco dining area. Up on the skylounge, soft colours create a welcoming mood and there is a large curved settee opposite an arched wall featuring a Bang & Olufsen television screen and stereo surround sound system. Twin 480hp Caterpillar diesel engines give her a range of 5,500 nautical miles at 10 knots.